The best book to come out by the new publishing company in Springfield, MO is this 1994 volume. 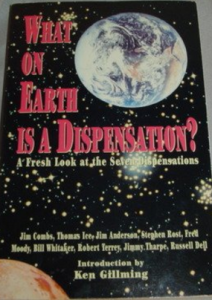 It is authored by nine capable men who are dispensational pretribulationalists and connected with the Baptist Bible Tribune, Baptist Bible College and Graduate School. The uniqueness of the book, in a market flooded with this subject, is the easy lay-out for use in teaching, in Bible studies and Church. Also, Part I is a concise history and update on the subject which is well-done, brief and yet informative. We hope that the Tribune Publishers will continue in this tradition and help fill a void that exists in fundamental Baptist literature.